There were smiles all around as area children in need visited our center today for Operation School Bell! Area dignitaries, CMS school employees, Second Harvest partners and even Sir Purr of the Carolina Panthers and Blaze from the Charlotte Fire Department all smiled while serving as “personal shoppers” for CMS students. 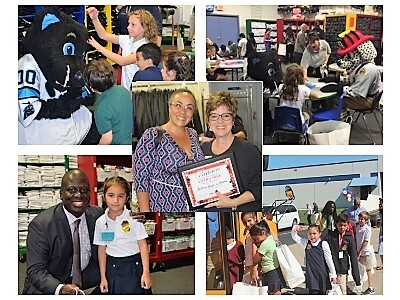 Our member volunteers smile every Tuesday through Friday as CMS students selected by CMS arrive to shop for their new school uniforms, jackets, shoes and more in our Operation School Bell “store” but their smiles were even brighter with help from our community partners and mascots.